Franz Liszt was a Hungarian pianist and composer during the 19th century. At the end of WWI it was given to Austria. View a modern photo of Liszt’s birth house. View a portrait of Prince Esterházy. View a lithograph print of Carl Czerny, Liszt’s teacher. Learn more about Carl Czerny. To appreciate the influence of Czerny, view this “family tree” that originally appeared in The Etude. If you play the piano, you may enjoy working through some of Carl Czerny’s piano studies. 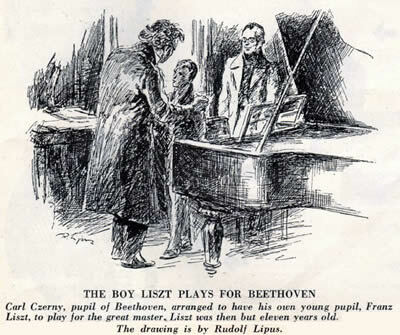 View an illustration of Liszt playing for Beethoven. You’ll find one of Liszt’s compositions on poetry by novelist and poet Victor Hugo below (“La tombe et la Rose”). View a photo of one of Liszt’s not-so-simple pianos from his apartment in Budapest. Learn about the history of the Court Theatre at Weimar. We will cover Wagner, Schumann, and Schubert in later studies, but for now you can learn a bit more about them at Classics for Kids. There are many characteristics of Liszt given in the story. Write a character sketch of Liszt. Younger students may enjoy creating a character trading card with this free interactive at ReadWriteThink.org. Create a banner to illustrate the author’s conclusion: Truly it is better to give than to receive. The composer of “Parsifal” and “The Flying Dutchman” is Richard Wagner, whom we will cover in a later study. View the beginning of “Hark, Hark! The Lark” written by Schubert and transcribed by Liszt. Add Liszt to your composer timeline. You can write or narrate your story on Liszt notebooking pages below. Use the “Some Questions” section as oral or written narration prompts. Franz Liszt (1811–86) was born in a small town in Hungary. His early life was like that of many other musicians. His father was his first teacher, and the boy startled all who heard him when he gave his first recital at the age of nine. The next year found him in Vienna where Beethoven was impressed by his gifts and where Liszt stayed for two years to study with Carl Czerny (1791–1857), a pupil of Beethoven’s…. Musicians were discovering that the ever improving piano could be used for effects that had previously been possible only with a number of instruments. Liszt had hands that were naturally good on a keyboard. His teacher, then later he himself, developed his skill as a virtuoso to a degree that had been unknown. The sad result was that in some of his own compositions he almost forgot music in his efforts to create brilliant sound-effects on the piano. From Vienna, Liszt went to Paris where he was idolized for his ability as a virtuoso. He was extremely generous and seems never to have said “no” to a person who needed help…. Liszt’s fifteen Hungarian Rhapsodies, based on the rhythms and melodies of his native land, are his best known works. His most important contribution to music, however, was his development of a new form of orchestral music, the symphonic poem. In most cases there are notes in the concert program that give the story of the symphonic poem. The ideas and characters are represented by melodies (motivs) that can be traced through the composition as the story progresses. Biography for kids from the Dallas Symphony Orchestra. Biography, selected works, and activity sheet at ClassicsForKids.com. Use this interactive at ReadWriteThink.org to create a composer’s timeline. Magazine issue featuring great composers including Liszt (scroll down). Complete collection on Kindle (can be read on any device with the Kindle app). Our favorite overall music appreciation reference book. Over 300 pages long covering 43 composers along with Christmas carols. Not only covers the influence of the composer but also how his faith influenced his works. Recommended reading and listening guides at the end of each section. Highly recommended! At EduPlace.com for locating Hungary and Austria. PAT map for locating Raiding. PAT map for locating Vienna. This free set of generic pages from HomeschoolNotebooking.com goes perfectly with our studies.